It may be time for winter but just keep in mind…December 21… first day of winter has a bonus. The days start getting longer and longer! For those of us who set our sites on springtime, that’s always a good thing to remember. In the mean time you can feed your garden habit by growing the impressive Amaryllis. I have good luck with the boxed Amaryllis bulbs found everywhere right now but consider some of the Amaryllis bulbs that come “naked”, without plastic pot and peat moss. Many local nurseries carry them in the typical bulb crates. Buy the biggest ones in the crate. Besides the usual red and white ones, Amaryllis come in orange, salmon candy-striped and bright pink. They are SOOOOOO easy to grow and the resulting bloom makes you look like a gardening genius. Most sell for less than $10. As you drive around the South Sound, you will see spruce trees whose insides seem to be gone. They have great new growth but zero needles on the inside and down the center of the tree. As you might suspect, that’s not normal! The culprit is called a spruce aphid. It begins its cycle in January when you are least likely to pay attention to what’s going on with your conifers. There are two ways around this spruce denuding. The first would be not to put a spruce in your yard in the first place. There are plenty of conifers with spruce like looks that do not have this ongoing pest problem. If you already have spruces in your yard, January is the time to spray them and prevent the aphid from ruining the ornamental value of your tree. Nothing can be done once the damage is done. The spruces do not put out new needles on the inside of the tree. Neem oil spray is the safest and most organic way to stop the aphids. After that, you bring out the bad stuff. History can be really exciting. Let me rephrase that …history can be really exciting if it’s spoon-fed and has plenty of gardening references. Yes, such a link exists. Two books have surfaced in the last few years that link history with gardening in a very palatable way. Both books are by British author, Andrea Wulf. 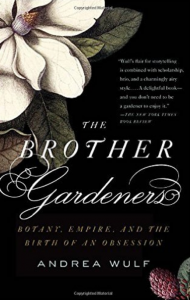 In her first book, “Brother Gardeners”, Wulf tackles the relationship between 18th century American nurserymen and British plant collectors. Wulf recounts the passion British gardeners had for the native plants of the North American continent. As a matter of fact, England’s beautiful gardens began with an influx of our native plants. 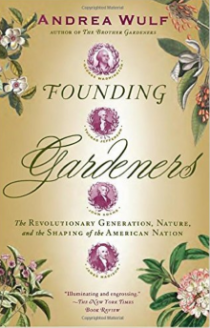 In Wulf’s second book, “FoundingGardeners”, she equates the importance of horticulture with the politics of the founding fathers. When they’re speaking to each other, today’s politicians use golf games to “schmooze”. The founding fathers used horticulture. Deals were struck and minds were changed while strolling through gardens and discovering new plant material. Both books, filled with anecdotes and name-dropping, make early American history easy to swallow.